If you have the opportunity to purchase a historic home, you are getting the chance to own a beautiful piece of history. The home may have been lovingly maintained before you purchased it, or you may need to do some repairs when you move in. You may even need to completely restore the home, which you may find to be a fun challenge. The roof is one of the biggest areas where your historic home is likely to need attention. The roof takes a battering over the years, and it performs one of the most important jobs on the property. So it is likely to have some issues, and if it does, you need to get them addressed immediately. With historic homes, the roof is also one of the most important architectural elements lending it character and shaping its appearance. You can’t just slap any old roof up there and call it a day. You need to work with an experienced roofing company in Scottsdale to make the right roof repair or to install an appropriate new roof. The key to successful historic renovation or preservation is to use the materials that would have been used when the house was built. If you need a new roof, you should start by looking at the current roofing materials. If it’s the original roof, you’re in luck. If it’s a replacement roof, you’ll have to determine if it was replaced in the same era or if it was a later replacement that respected the original building style and materials used. Typically, on a historic home, you’ll be looking at wooden roofing since wood was often used as a cheap and readily available material. With wooden shingle roofing, you need to identify what type of wood was used, the size of the shingle, the exposure length and nailing pattern, whether the wood was sawn or hand split, other details like beveling or dormers, decorative elements, and any other identifying details. You will need to match those details as closely as possible. In some cases, asphalt shingle may have been used, but those cases are rare. Slate tile roofing in Scottsdale is much more likely as an alternative to wood. You will need to take the same steps to identify the original slate tile roofing used so that you can replicate it if possible. The original roofing materials may not always be available or even practical. For example, you may not have the budget to replace slate tile roofing, or the house may be suffering from broken tiles and other problems requiring expensive roof repair because it has the wrong pitch for that material. In that case, you can choose a substitute material that either mimics the look of the original material or that is also appropriate for the time frame and architectural style of the home. Other materials can often mimic the look of wood or slate, such as concrete or even asphalt shingle. When all else fails, you can choose a simple material that may not be historically accurate but that won’t detract from the style of the home. Black asphalt shingle is often used because it in unobtrusive and complements most homes. In many cases, Scottsdale roof repair is preferable to roof replacement for historic homes. A new roof can be quite costly, and depending on the material used, the roof can last quite a long time with the right maintenance and repair. Hiring a professional to repair the roof will maintain the integrity of the historical accuracy. However, in some cases, roof repair just won’t be enough. For example, Even highly skilled slate tile installers can end up damaging other tile while they are making repairs. Over time, the cost of repairing slate will be more than replacing the roof. Working with a Scottsdale roofing contractor from a reputable roofing company is essential to the success of repairing or replacing the roof on your historic home. You need someone who can properly identify the original materials and advise you on the benefits of either replacing or the roof. 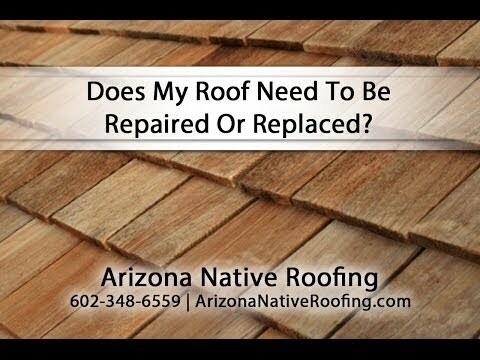 AZ Native Roofing is a top roofing company in Arizona, and our highly skilled and experienced contractors have worked on many historic homes. Our contractors perform both tile roofing and shingle roofing on historic and contemporary homes, and they can give you expert feedback on whether your budget would be better spent on roof repair or a whole new roof. Call us today to start exploring your options and to get an estimate for your historic home’s needs. Will The Winter Cold Damage My Roof?